I’ve banned myself from the library – again, which is just as well as I seem to be hauling home new to me books almost on a weekly basis. Yep I was book-mugged again. 1. A Book of Stories from the Norse. 4. The Christmas Card Crime – a book of short stories which I’ll keep for next Christmas reading. I’ve never read anything by that author before. Have you read any of these books? This entry was posted in Books and tagged Angela Brazil, Blackie books, British Library Crime Classics, Conn Iggulden, Julian Symons by Katrina. Bookmark the permalink. I have been waiting for The Christmas Card Crime to come out in the US – but when I finally do get hold of a copy, I’ll probably save it for Christmas as well. I was so pleased to get The Christmas Card Crime really cheap in a secondhand bookshop. Me too – and it’s just too easy to pop over to the Fife Libraries catalogue to reserve books that I’ve just read about on a blog. I’m trying really hard not to though! 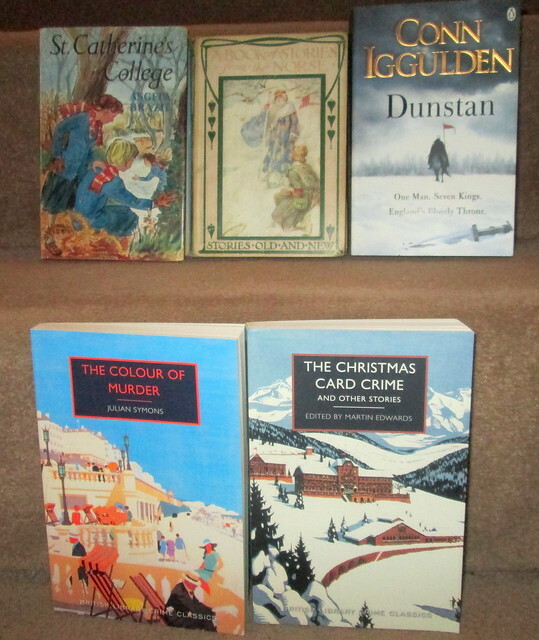 Conn Iggulden was new to me too until just recently when I read a review of this book from FictionFan – not sure of you read her blog? Here’s her review anyway – https://fictionfanblog.wordpress.com/2019/04/10/dunstan-by-conn-iggulden/ She rates it very highly! I drop in now and again to Fiction Fan but I’ve just subscribed. My friend Nigel who gave me the book is really keen on Iggulden, so I’m looking forward to this one.